Our Lower School and Middle School students spend time in the woodlands, stream, gardens, and fields of our campus, observing natural science at work. In Grade 5 students spend three days at Echo Hill Outdoor School on the Chesapeake Bay to extend their integrated science and humanities study of our state, Maryland. In Grade 6, students spend four days at Bar-T Mountainside in Urbana, Maryland, focusing on team building skills and extending their science studies with projects, such as windmill designs, geo-caching, and tree-planting activities. 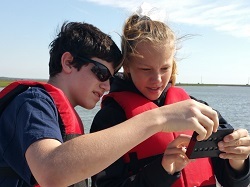 In addition to multiple environmentally focused day trips, students in Grade 7 spend most of a week in Chincoteague to supplement the study of the interdependence of plants, animals (including humans), and environments. Students in Grades 7 and 8 explore the beauty of nature through photography field trips. Eighth graders also hike Old Rag Mountain, and spend a week in New Orleans engaged in service learning projects.